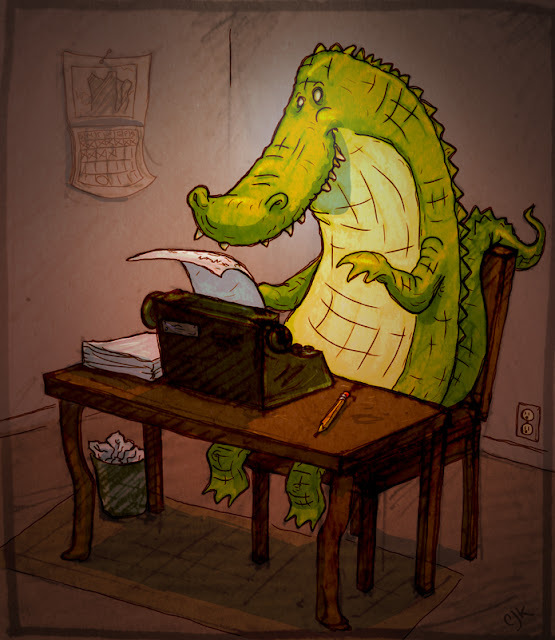 that's right, he's busy writing his memoirs... alligator memoirs. "... and then I stuffed the guy under a rock to save him for later." oh man... alligators are evil... yet I'm so fascinated with them! This one is traditional with a bit of digital wonderment... okay, a lot of digital wonderment. But it's wonderment so that's okay. anyway... I hope you enjoy. And if you call me and the secretary starts hissing at you, you'll know why. On a side note, I get a lot of visitors on this site that come here by googling "crocodile man" weird. Thunder… thunder… thunder... THUNDERCATS HO! I had a crazy idea that wouldn't leave my mind. So… here it is. What an awesome show that would have been! Japanese Thundercats?! 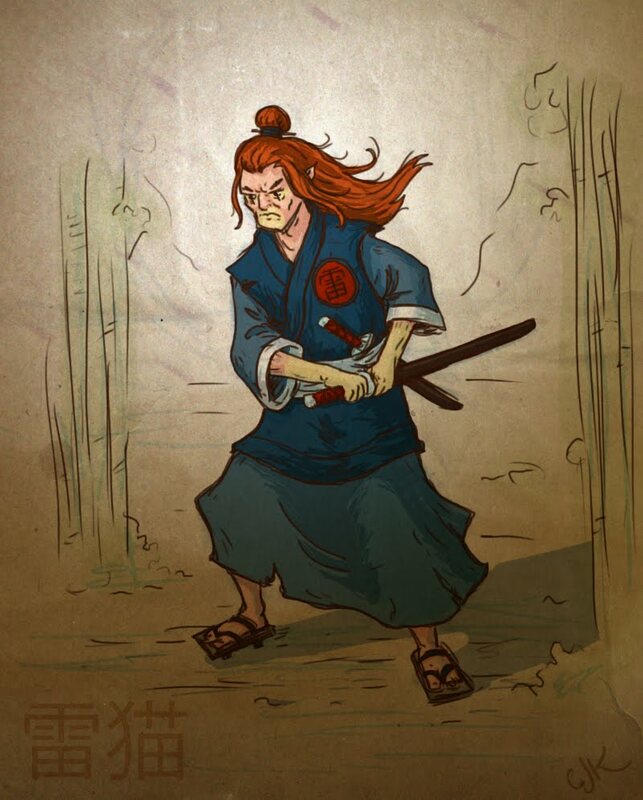 Samurai Lion-O?! I will always love the original Thundercats. Lion-O's man-mane was something else. He put Fabio to shame. Honestly I haven't seen the new series yet… but I'm not itching for it or anything. Hope you enjoy cause it was fun for me. Oh, and go check out the tentacle blog. I could resist it no longer! 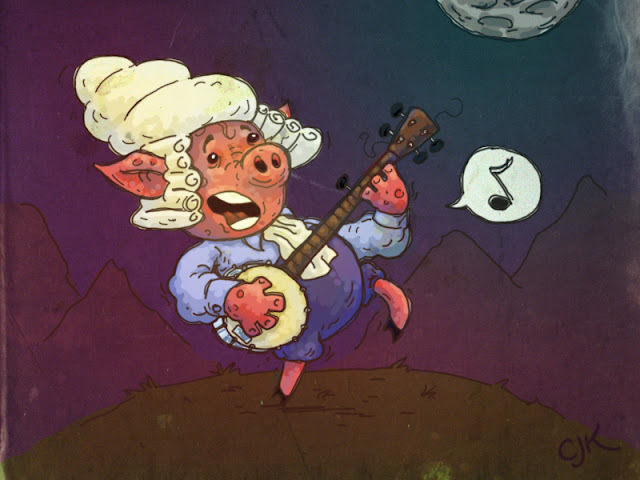 I Banjo-Pigged... and Banjo-Pigged in a classical way. It was fun... In an Aristocratic Redneck way. You can go over thar and see this very piece in all it's exact same glory! 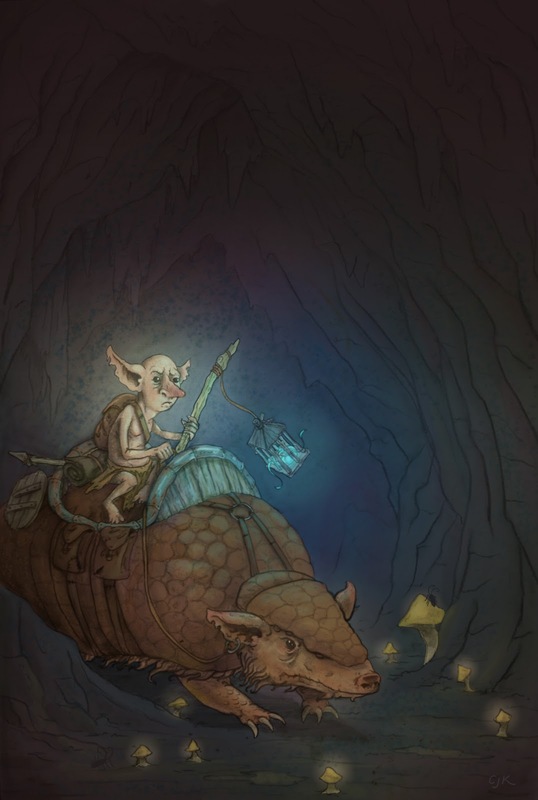 But you can also go see a slop full of other Banjo Pigs by some great illustrators and Artists. 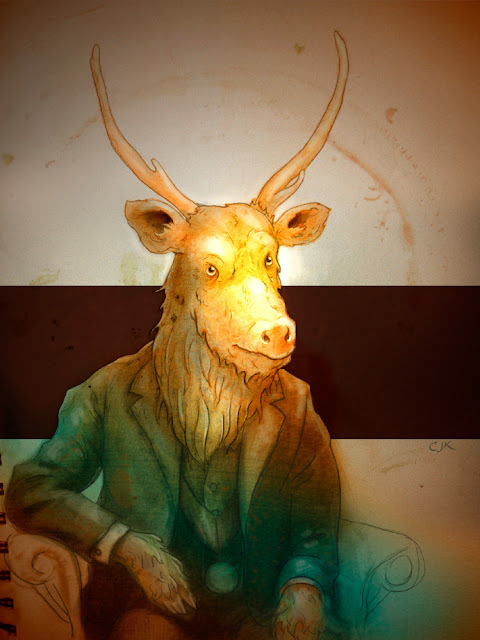 Once again, This is Cam Kendell... Freelance Illustrator, Artist, Designer, writing on a blog. If you are interested in getting a quote for illustration work shoot me an email. Oh, and stay tuned for more outrageousness. Yes my deer... this is another piece. Puns are so punny. I'm continuing to try new things and techniques. I call this Sambar En Repose. He looks so distinguished and fancy I feel underdressed while typing this. Plus he almost looks mad... like maybe we've disturbed him in his study. sorry, we'll let you get back to whatever you were doing. This one involved, traditional, digital, and photographic trickery. Right now on Kickstarter you can pledge to get a copy of what I think will be a really fun game. 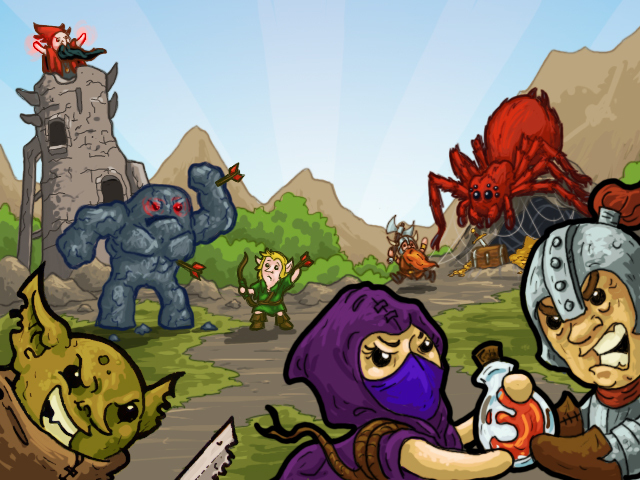 The game was created by Sam Coates of Potluck Games and his has a load of dice. Who doesn't love rolling dice! Watch out! 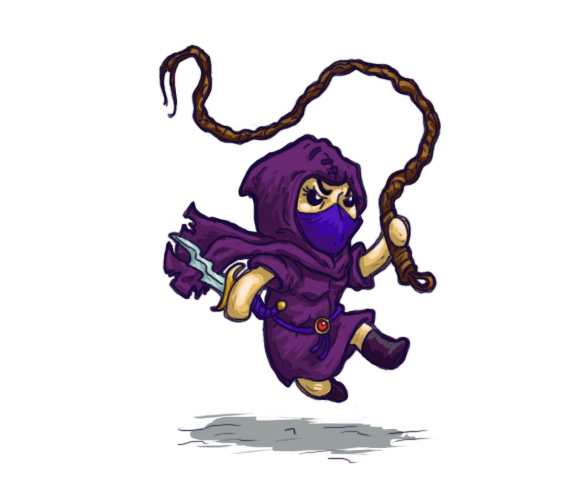 she's got a whip! Or is that just to distract you from the fact that she has a crazy squiggly, stabby dagger? I dare you to tell me who doesn't like vikings... well, may those they pillaged... but they are by far the exception to the rule. The funnest part was probably the spider webs in the cave... don't know why... I hope that elf dodges. Stone guy gonna smash you! And there you go. Definitely a fun project to work on. Go check it out and pledge! 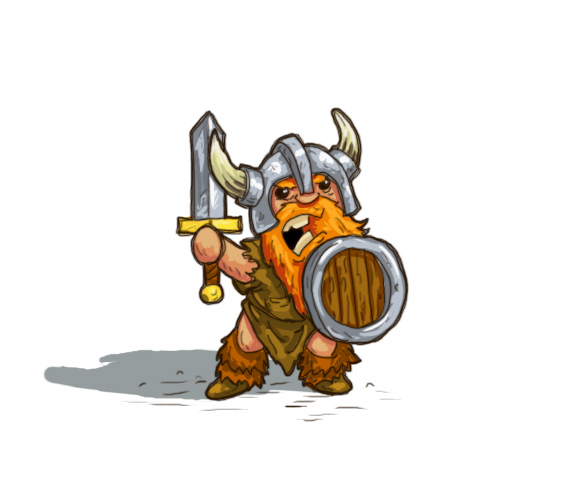 You'll get an awesome game when it is funded and maybe I'll get to do more illustrations for it! As you can see I ended up going in a completely different direction than I had planned in the last post. I like it better.... HOWEVER, I want to improve my game. So... load the cannons and light the fuses. well, here is a work in progress I thought I'd share. I'm playing around with the process on this one. Trying out new techniques. I'll post the final when the time comes. 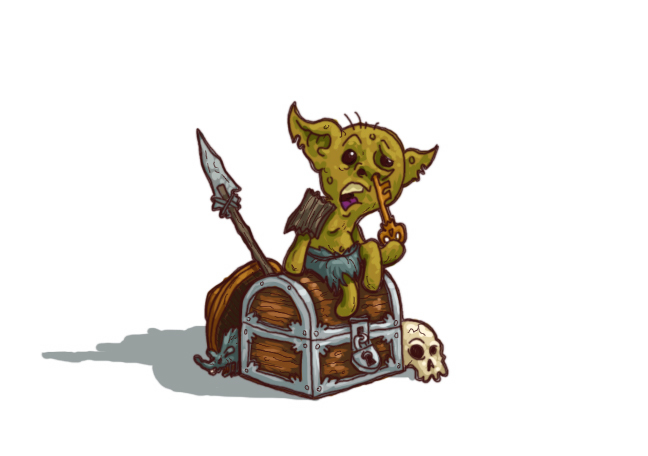 Again, I am open for illustration work. Contact me for more info or a quote.